The Dancing Cop, Tony Lapore at Dorrance and Westminster Streets in October 2009. Were you worried you weren’t going to see the Dancing Cop this year, well don’t. PROVIDENCE, RI – Providence’s ‘Dancing Cop,’ Tony Lepore, returns to downtown Providence Dec. 9-24, 2012. He will be on the corner Dorrance Street and Westminster Street weekdays from 12 to 1:30 pm. 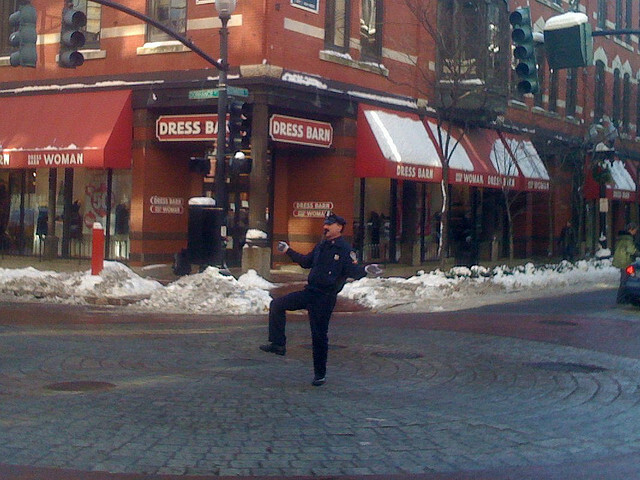 The Dancing Cop’s appearance in downtown Providence is something harried holiday shoppers look forward to each year. Once a fulltime Providence police officer, Tony Lepore danced his way from directing traffic to international stardom. He has appeared live on television including THE TODAY SHOW, GOOD MORNING AMERICA, THE ROSIE O’DONELL SHOW, THE ELLEN DEGENERES SHOW, “LOOKY LOO” SEGMENT ON MSNBC, COUNTDOWN WITH KEITH OLBERMANN, several international television productions, on the radio, on the stage and on television commercials.